There's no better place in the whole country to get lost than in Sequoia National Park! There are forests to explore, mountains to conquer, and meadows to meander through. Whether you want to get your adventure on and discover all the hidden gems of the park or simply spend some time pondering your microscopic existence while gazing up at some of the world's tallest and oldest trees, Sequoia has you covered. Here's our guide to getting lost! First, you should know that the Kaweah River flows through Sequoia National Park. If you're visiting towards the end of summer this means the river will be much calmer and is a perfect way to spend the day floating through the park on an inner tube or inflatable raft. 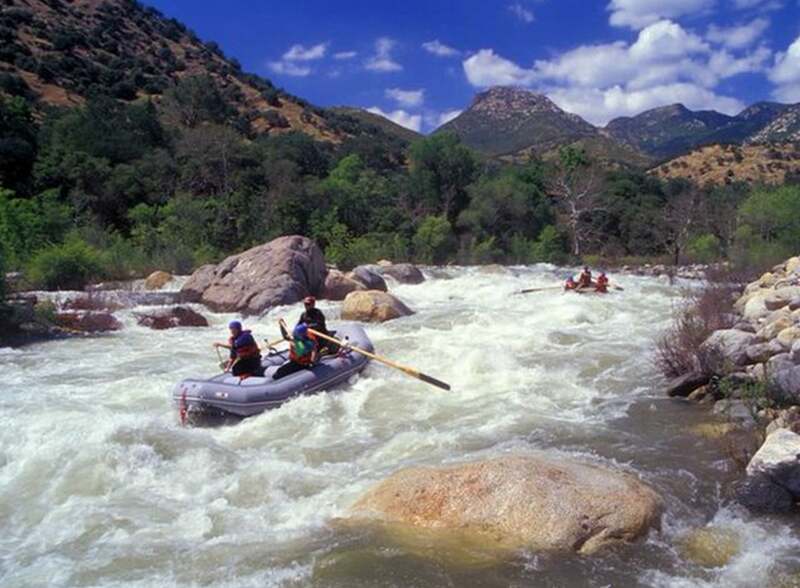 Rafting the Kaweah River when the rapids are moderate. -Sequoia National Park is often lumped in with nearby Kings Canyon. The two are contiguous, and the National Parks Service manages them as one unit. If you're in the area, it's definitely worth it to hop over to Kings Canyon! -There's tons of wildlife in the parks, but especially be on the lookout for bears and mosquitos. Pack bug spray, and brush up on bear awareness... and make sure to bring bear spray and bear-proof containers for food and other items. -As with many National Parks, cell service here is spotty, but because Sequoia is mostly wilderness, it's especially important to plan around this. Always have a map, and if you're meeting up with others, don't expect to be able to send them a text. Otherwise, take advantage: disconnect for a bit and enjoy your surroundings! Finding meals outside the park has its advantages: you can find local gems like Anne Lang's Emporium. Part florist, part gift shop, part coffee shop, part deli, part ice cream parlor, and all adorable, this local joint has everything you could possibly need for a day in Sequoia. They'll even pack up ingredients for sandwiches into a picnic basket for you to take into the park, which sounds kind of perfect! The Ol' Buckaroo is another great restaurant outside the park. The menu, which features locally-sourced and organic ingredients, isn't huge, but you can taste the love and care they put into preparing the food. Plus, the setting is unbeatable: it's a food truck parked by the river, with a rustic shelter and several picnic tables scattered about. Bonus: they offer brunch on the weekends and live music some nights! Sequoia is famous for its trees, but to see one of its cooler attractions, you'll have to head underground... to the Crystal Cave! There are actually lots of caves in the park (240 to be exact), but the Crystal Cave is the only one that's open to visitors; the others are only open to researches who keep an eye on the geological and biological state of the caves and their special ecosystems. You can only go inside the cave in the spring and summer, but it's worth checking out. To visit, grab tickets at one of the visitors' centers and then get ready to experience 3.4 miles of insane subterranean rock formations. There's nothing quite like camping in Sequoia, amongst the majestic trees. Lodgepole Campground is conveniently located two miles from the Giant Forest Grove, well within the park, and has nice amenities like hot showers, ranger programs, RV sites, and a location near a village with a camp store. Plus, you can make group reservations in advance here; it's one of the few campgrounds inside the park that allows that. If you don't know a ton about sequoia trees, stop by the Giant Forest Museum for a quick lesson on why they're so important to preserve... beyond the fact that they're gorgeous, of course. It's not a huge museum, but it's filled with great information, and it's one of the few places in the park that remains open in the winter, so if you want to warm up after a snowy hike, this is your spot. If you're going for the authentic National Parks experience, then you'll want to stay in the Wuksachi Lodge. You get the rustic atmosphere that National Parks lodges often have, with the cedar logs, stone fireplaces, and picture-perfect views, but they also have wifi and a cocktail lounge and all the stuff you want from a classy resort. Plus, the convenience of staying inside the park is pretty appealing! Of course, there's more to Sequoia National Park than caves and forests... like waterfalls. One of the park's prettiest is Tokopah Falls. It's a popular hike, and with the trail taking you through forests, into granite canyons, and alongside the bubbling river, it's not hard to see why. It's a good length hike at 3.4 miles, round trip, and offers picture-perfect views the whole way! Fun fact: the taller, bigger trees in the park have names! The President Tree, which is the third largest in the park, was named for former Commander-in-Chief Warren G. Harding. It's about 3,000 years old, and is 241 feet tall and 27 feet wide at the base. It may only be the 27th largest sequoia in the world, but contains some of the most wood by cubic foot, thanks to its dense branches! The General Sherman Tree isn't the tallest tree, or the oldest tree, but it is the largest living tree in the world at 274.9 feet tall and 25 feet wide at the base. You really can't comprehend how big it is until you see it-- it definitely stands out from the rest of the trees in the grove. Pro tip: visit the Giant Forest grove early if you want a picture of General Sherman before he gets surrounded by other tourists. Tharp's Log is a log cabin that's actually made from one single sequoia log-- which is a pretty cool way to understand just how big sequoia trees are. Hale Tharp, the first non-Native person to enter the forests of Sequoia, hollowed out this fallen tree using fire, and lived in it for a short time. The 55-foot-long room has a window, a door, and even a fireplace, making it a quaint and cozy little house. And, of course, right outside his door is the gorgeous Crescent Meadow! If longer, multi-day hikes are more your speed, then lace up your boots and hit the High Sierra Trail. It can take up to 10 days to make the hike, which crosses the Great Western Divide though Kaweah Gap, follows Kern River Canyon, ascends the Chagoopa Plateau and then takes you up the majestic Mt. Whitney. Because a lot of the park is wilderness, backpacking through the interior of Sequoia is one of the best ways to truly experience its rugged beauty! The best view of the whole park is from the top of Moro Rock. Depending on whether or not the road to the Moro Rock Parking Lot is closed, the hike up could be as long as 2 miles or as short as .6 miles, complete with 400 stairs up the granite dome. It looks a lot more intense than it actually is, and the views down into the valley from atop the monolith are pretty incredible! Hospital Rock is a great place to learn about the Native Americans who lived in this region. Here, you can see ancient pictographs left behind by these early Americans, as well as bedrock mortar sites. The public archaeological site got its strange name from the fact that local Indians helped treat early settler John Swanson's injured leg around here in the mid-19th century. Bonus: Hospital Rock is great for climbing, so bring your climbing gear! Surprisingly, John Muir, the famed naturalist and National Parks advocate, didn't consider Sequoia's forests or mountains its highlight-- instead he lovingly bestowed the title of "Gem of the Sierra" on Crescent Meadow, one of the park's easier hikes. It's a beautiful place, flat and lush with greenery, and is tucked away among forests and mountains. It's surprisingly peaceful and quiet... it's almost more of a relaxing stroll than a hike. Bring along a picnic lunch and make an afternoon of a visit here! Sequoia National Park is open year-round, and even though some roads and facilities close in the winter, there's great snowshoeing in the park, and you can enjoy the trees covered in a blanket of peaceful snow. Spring, summer, and fall are the most popular times to visit, although the park rarely gets too crowded-- it sees about 1/3 the visitors of nearby Yosemite. Waterfalls and wildflowers are at their peaks in the spring and summer, as well!